I couldn’t let this momentous occasion pass without sharing it with all of you. 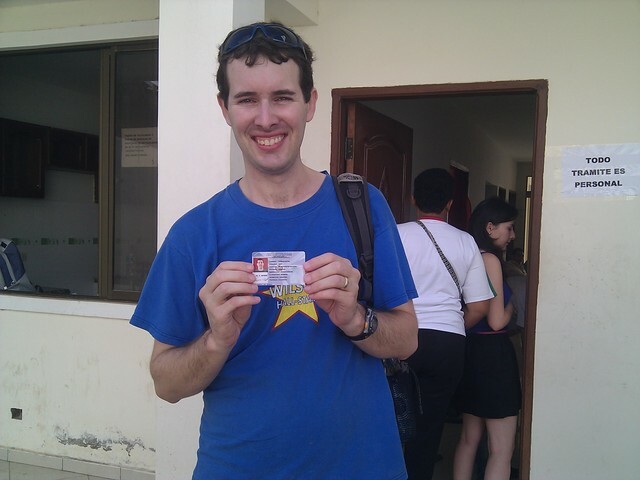 As of 2:00 pm May 30, 2012 Tom and I never have to go to the Bolivian Immigration office EVER again. The visa process has been a continuing stress for us since our arrival in September 2010. Document after document, hours upon hours spent waiting in lines (I’m talking over 15 hours, just in line time) hours of traveling, significant money spent and sleep lost, all of this culminating in our most recent government ID process. So a funny thing happened in March. 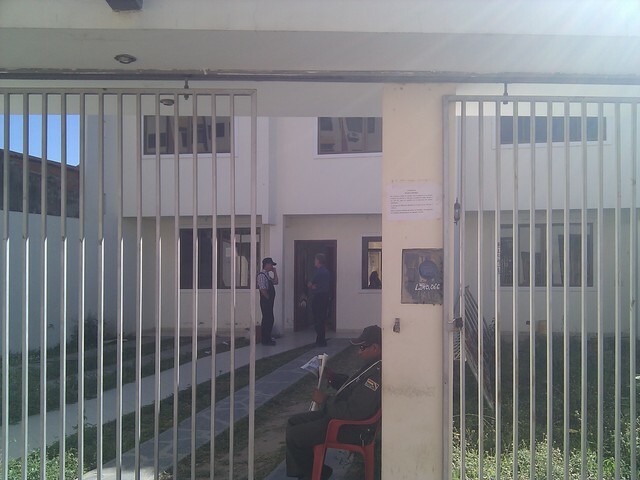 The Bolivian Immigration office, which serves the whole region of Santa Cruz, packed up one night and moved silently across town leaving not so much as a sign about where they had gone. The taxi drivers didn’t know, the bus drivers didn’t know and we certainly didn’t know. The other volunteers were there days before the office moved and said no one informed them in any way nor did they see any informational signs about it. And beyond that, they splintered off the government ID department to a third location. So after a bit of hassle we located the new offices, one in the first ring, the other in the fourth ring. We pick up our passports in the first ring office and head out to the fourth ring office to apply for IDs. It’s a well demarcated, stately office. lol oh wait no, it’s a house on a muddy, back-road residential street with a letter-sized piece of white paper for a sign. It’s like they don’t want you to find it. And when we arrive at 9:00am we’re told they’ve already given out all the numbers for the day and that we have to arrive at 6:00am if we want to be helped. Ok, fine so a few days later we get up at 4:30am, get the first shared taxi out of Montero at 5:15am and arrive in line at 6:15am. The office is supposed to open at 7am and there’s already a significant line, and I’m already crabby. No where to sit so we stand and stand. A secretary shows up at 7:10am but says she doesn’t have the key. Finally the lady with the key strolls in at 7:30am. We receive our numbers, 21 and 22 and we’re told that they probably won’t get to us until 11am so we can go and come back. So we go and sit in a coffee shop and read for awhile. At 11am we went back and experienced first hand the glacial pace at which the office functioned but we got our stuff in a-ok and were headed for lunch by noon. We were told to come back May 30th to pick them up but pick up is only possible between 2pm and 3pm. So we went and we got them and we don’t plan to go back ever! Wow, May just took on a life of it’s own so I’m going to attempt to give a brief overview of everything we’ve been doing to catch you up. 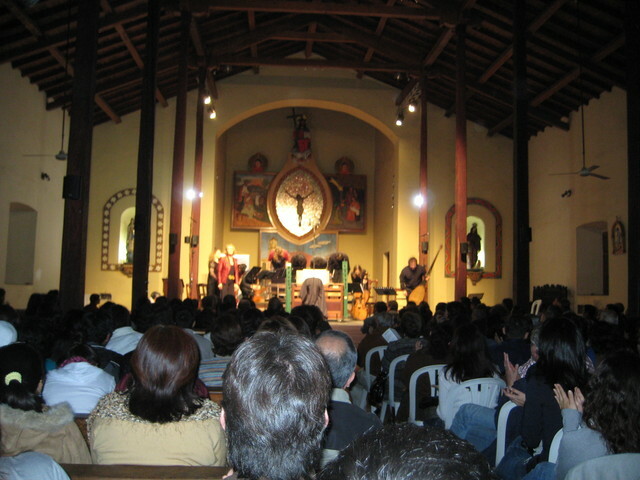 At the end of April and beginning of May we had the Festival Internacional de Musica Renacentista y Barroca Americana, Bolivia’s biannual baroque music festival! People come from all over the world to play and each group is required to perform at least one locally-composed piece. The baroque music tradition began here with the Jesuits who came and built the beautiful Jesuit missions and educated the people in music. 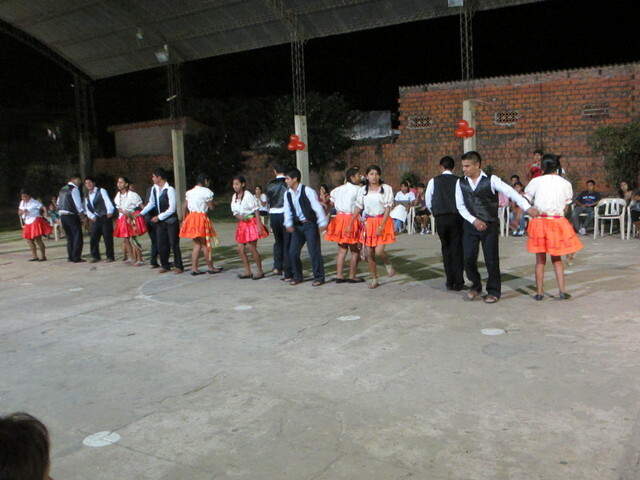 The festival had all the traditional instruments and some really talented Bolivian vocalists. I invited the Sisters to go with me and we ended up with a whole bus full of Sisters and hogar girls. 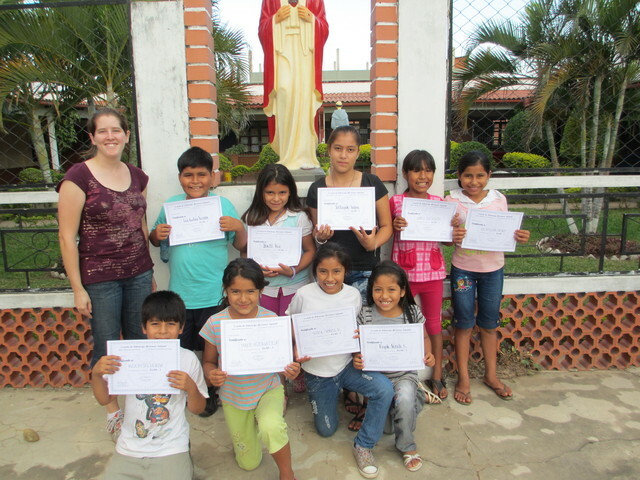 The first weekend of May I took a group of 9 kids ages 7-12 from our parish center to the Escuela Liderazgo Misionero Infantil in Santa Cruz. It’s a two-day retreat put on by the Archdiocese and provided education about every Catholic’s call to be a missionary and some leadership experience. We all had a good time but it was a lot responsibility for me and I was happy to return them to their parents at the end! 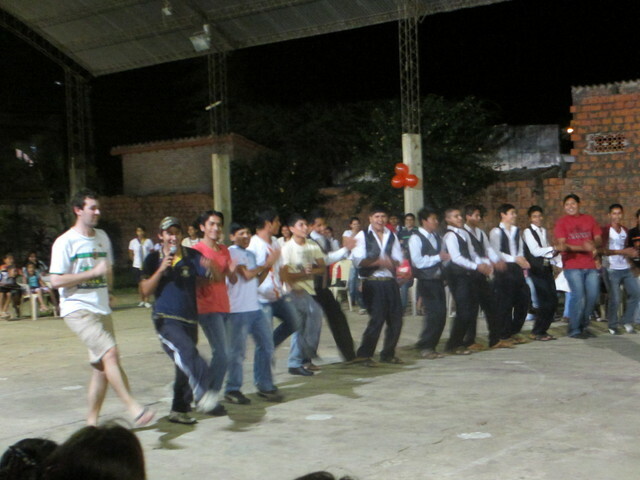 May 17-20 we celebrated the Institute’s Anniversary with an Exposition, Mass, Party and Futsal Tournament (Futsal is when you play soccer but on a small concrete court with a smaller, harder ball). No pics, sorry we were too busy. But the soccer team we put together of Tom’s class and mine won the tournament! 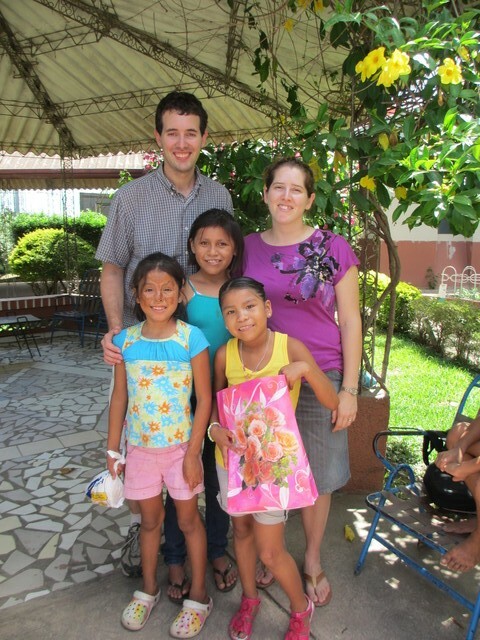 We’ve also had the yearly Convivencias and Baptism classes at the Kinder. The Convivencias are required ‘training’ for all the parents where the professors present on some topic. Last year they presented on spousal abuse and this year was about how the breakdown of family structure negatively affects children. They’re always downers and it makes me sad to think about some of the realities these kids are living. For a lot of kids at least one parent is in Argentina or Spain working, there are a lot of issues with drunkness, physical abuse and abandonment. But it’s not all bad, we also have great two-parent families who are super supportive and over protective of their children. Baptisms at the Kinder are coming up on June 10th and we’re going to be godparents again! We were asked by the parents of one of my students because they don’t have any family in the area and don’t know many other Catholics. (Because they don’t go to church, but I working with them on that). Anyway our new god-daughter is named Ayelen and we’ve had lunch with her parents Alvaro and Mabel twice now and they’re very nice and very dedicated to the education of their daughter. And now it’s Mother’s Day here in Bolivia so we’d like to give a shout out to our own mothers Ann Riley and Maureen Kent. We love you and are very grateful to have you in our lives. 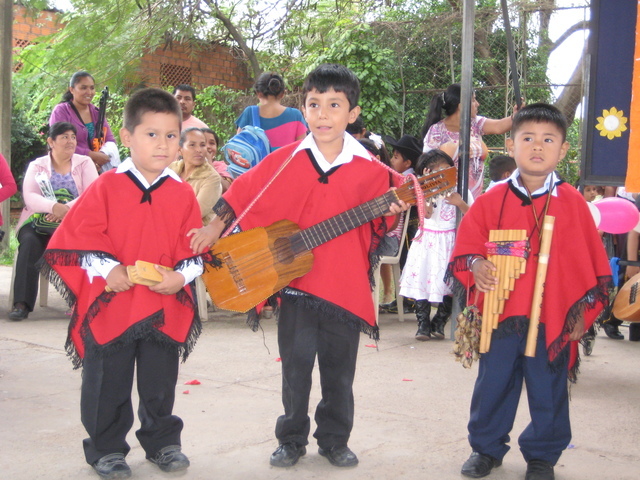 Here are some cuties from the Mother’s Day celebration at the Kinder with their traditional Bolivian instruments: wooden noise-maker whose name I don’t remember, charango (guitar) Siku/zampoña (panpipe), and quena (flute). Happy Pentecost Everyone! Peace be with you. So even though we have 7 and a half months left here, I’m already dreading going home and hearing this question. The problem is there’s no answer to it really. I’d like to give an example of one of my mornings last week. I didn’t get up and workout with Tom this morning because I had diarrhea all day yesterday and wasn’t feeling well. When I did get out of bed about 8:30 my sore throat reminded me of this cold I’ve had for going on a month now that won’t go away. The sun was out and it was already heating up so I put on my lightest, breathable clothes. I needed to clean the house today. Yesterday I had started but was thrown through a loop when I encountered a brown widow living under one of our tables. Once the extraction/identification was finished I had run out of cleaning time. So this morning, I put my clothes on quickly and decided resolutely I will get this house cleaned. Just then I look up and see the trail on the wall. I know that trail. Termites. I start investigating and find them eating one of my t-shirts. I take the t-shirt out to the burn bin and alert Tom. We clear out the closet and see that the damage is contained but they’re clearly coming from the wall. I go and eat some plain bread for breakfast and de-spider the kitchen while we wait for Madre Clara to pass by so we can ask her if she has any pesticide. She looks at it and blames it on our room being too humid, which it is, but we keep the windows shut during the day to keep the heat out/cool in. On the way back to our house, I see a beautiful white and purple butterfly I’d never seen before. I believe it was in the Papilio genus but I haven’t been able to identify it further than that. I also hear the band from the school next door playing “Sound of Silence” by Simon and Garfunkel. 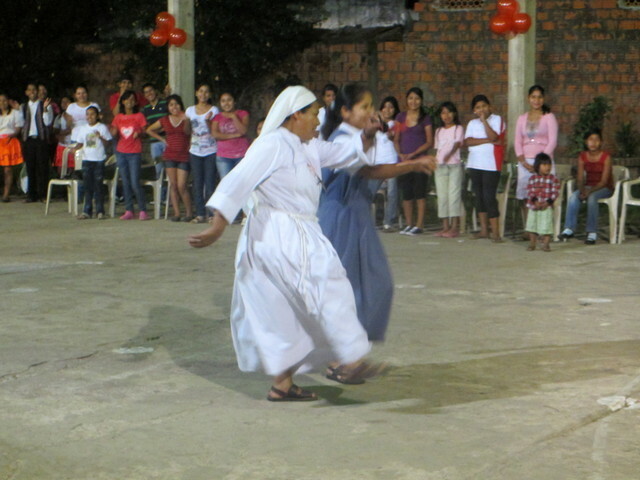 Madre Clara told me they were practicing to play for the funeral today. One of their third graders just died from dengue. I get back to our house after 11am in time to talk to Madre Inez about the Children’s Day party I’m supposed to be help with the next day but have no information about. Then all of a sudden it’s noon and I’m exhausted and still haven’t gotten the cleaning done. We pickup some non-appetizing rice and undercooked eggs from the Guarderia to eat for lunch. Bolivia is………. challenging, fun, frustrating, sad, inspiring, scary, different, exhausting, exhilarating, and yes sometimes even just fine. Life here just is what it is. You take it as it comes and try to keep smiling. Isn’t that what we’re all just doing really? Easter was exhausting this year. Actually I think I’m still exhausted from Easter. After Easter Vigil Mass there was an all-night lock in for all the youth. I opted to stay for it to hang out with my youth group. It was actually was more fun than I had expected. There was very little talking, it was mostly just singing and dancing. Plus a guest artist came named Jose Luis Melgar and his band was WAY better than our regular music. It was awesome to hear well-played music. 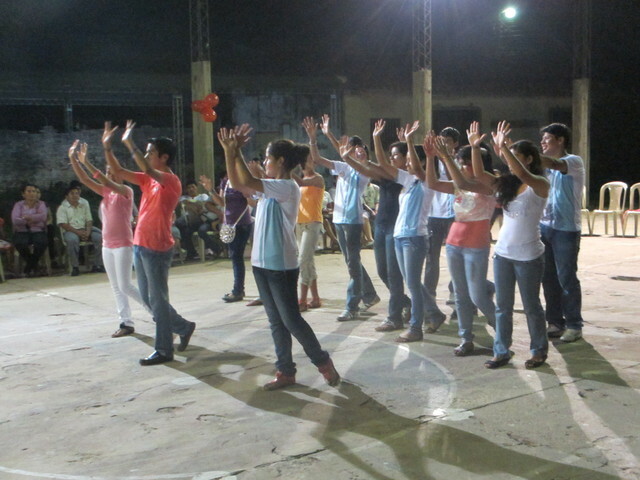 So we sung and danced the night away until 4am when the youth groups went out to greet the Risen Lord. The march was pushed an hour earlier this year because of the lock-in but otherwise it was the same as last year. We marched through the streets saying “Everyone wake up, Jesus is risen!” I was on a different route this year; I did the St. John route. Tom was on the Jesus route again and we all met up in the plaza in front of the church. My route was a little late for the 5am rendezvous because we had a long way to go. So we didn’t all march into the church until 5:15am, which turned out to be fine because the priest didn’t show up until 5:45am! That half hour waiting was killer. I hadn’t slept, I’d barely eaten anything all night and I’d just walked a mile and a half singing. Luckily the Holy Spirit was with us and we persevered. We got out of mass at 6:30am and by 6:45 I was eating breakfast at home. 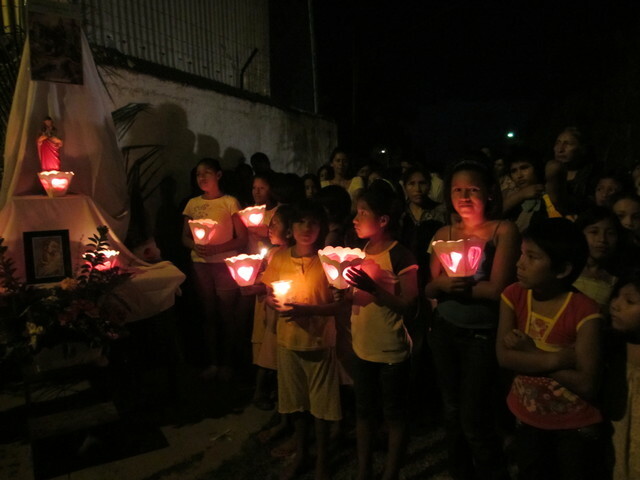 Palm Sunday is a huge deal in Bolivia. 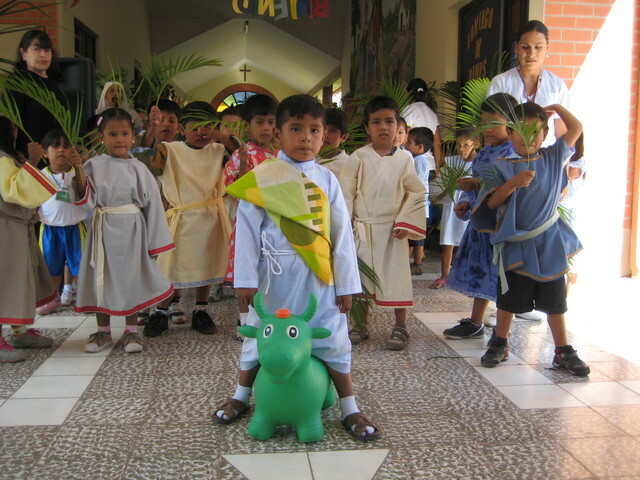 My Palm Sunday celebration was a marathon that started on Friday when Jesus riding a ‘donkey’ paraded through the Kinder. Then on Saturday at my 5pm youth group, we were reminded that we had to decorate the church for Palm Sunday. AND we had to bring all the materials to do so. Well, in classic Bolivian style, we had nothing but we started looking. For starters we needed 10 huge palm fronds from a palm tree called Motacu. Luckily, one of the girls showed up and said that her family had a Motacu and had just cut a bunch of fronds so we all went over to her house to see how many we could use. There were some mutterings about using a taxi or a motorcycle but Sister Inez said, “No, you can’t drag them, you have to carry them!” Not knowing what exactly we were getting into, I went happily to her house with the five other girls from our group. But when we arrived I was a little shocked, the palms were easily 14 feet long and not light. Plus, we needed to carry 10 of them and we were now 6 blocks away from the church. We decided quickly we had to carry them between two people to avoid dragging and Celia says, “Ok well each pair has to take three then.” Another girl and I attempt to pick up three but I can’t and drop them all. So, we decide to take two. I’ve got the leafy side and so I’m completely buried in palm, not able to see anything but my feet, as we walk the six blocks to the church. I had many doubts along the way but amazingly we arrived as did the other two teams. When we went back for the second round, a few more people showed up including two guys so the work was much lighter. We spent the next two hours tying the palms up and I finally got back to our house exhausted about 8pm. But no rest for the weary, Sunday morning I had to be up at 6:30am to cook my contribution for lunch and be ready to march at 7:30 as we paraded to a local high school for the annual World Youth Day celebration. This is a full-day event with a very long mass, dancing, break-out sessions and unending singing. After helping with cleanup, we finally starting walking home at 4:30pm. Thankfully, when I got home my wonderful husband was already cooking dinner, so I rested until 6pm when we had dinner with the other volunteers. 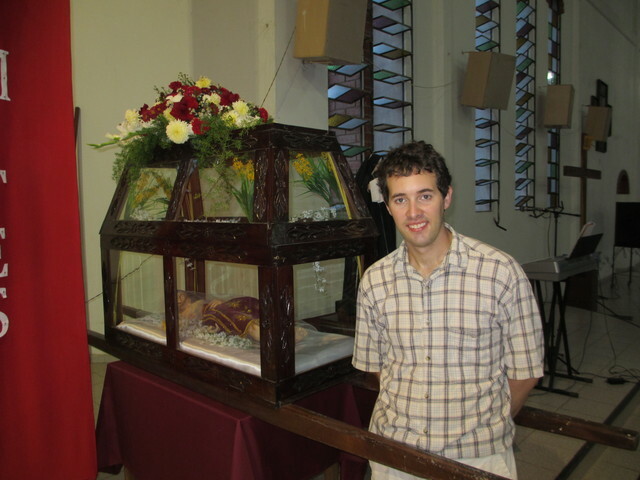 Then at 7pm I headed to church for evening mass. 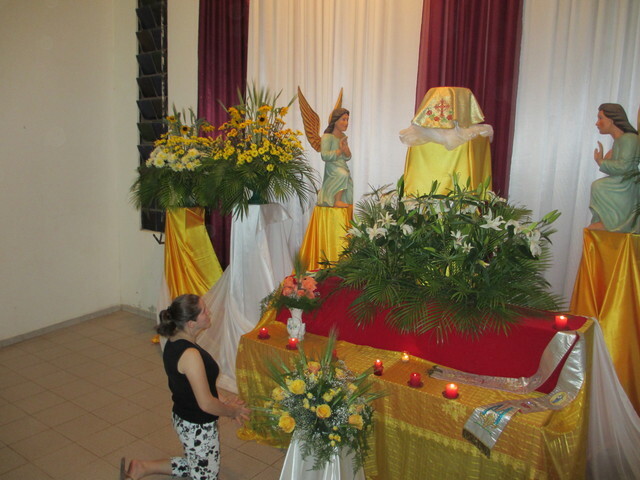 My youth group was also in charge of the evening mass for Palm Sunday and I had volunteered to read the first reading. 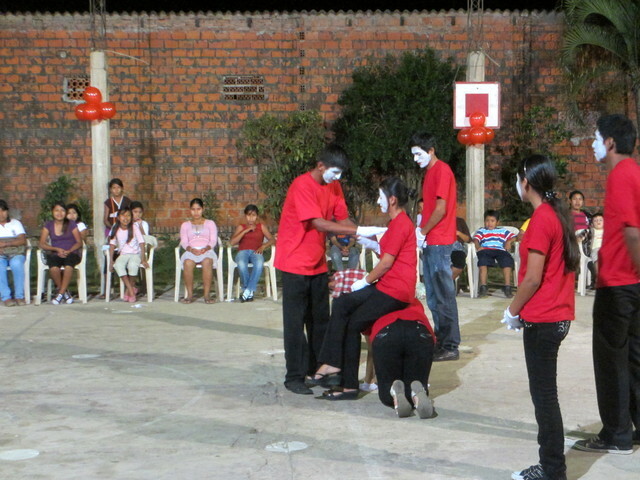 This was really exciting for me since it’s the first time I’ve done a reading in Bolivia! I really tried hard on my accent so that people would understand me and afterwards Sister Inez said it sounded good. (Positive praise is so rare from the Sisters, especially Sister Inez so I just want you to appreciate how amazing I felt). In addition, after going to two 2-hour masses in one day, I felt my spot in heaven was assured and it was nice to see everyone enjoying all our hard work decorating. The finished product looked great but it did seem a bit overboard, to me anyway. 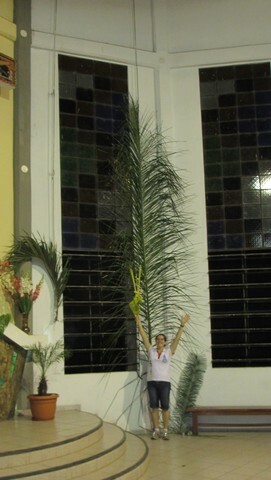 And since it’s a celebration, I also splurged for the biggest palm I could find from the vendors outside the church. This one set me back 5 bolivianos. The herbs in it, once blessed, are supposed to ward off bad spirits. 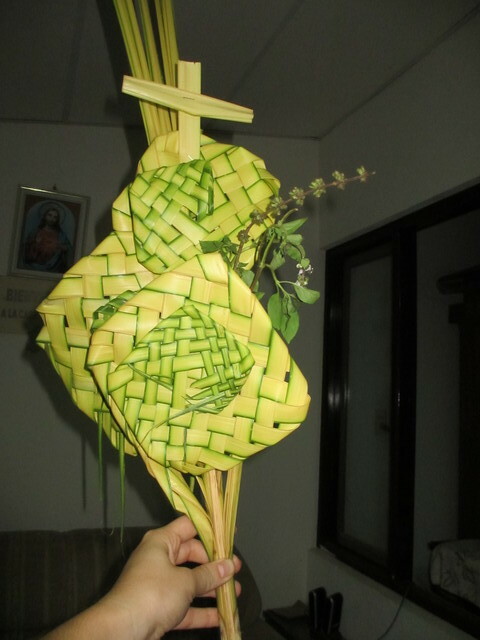 Blessed Holy Week to you all, stay tuned for more stories. So this weekend was actually really good for a lot of reasons. 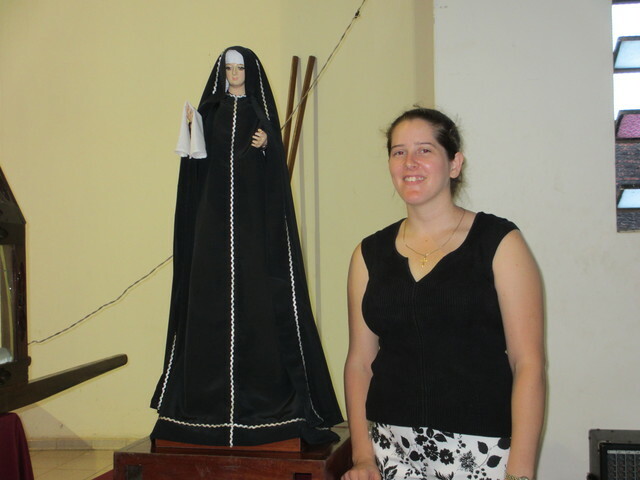 We had two different retreats, one Saturday with the Professors of Kinder, Institute and Guarderia, and Sunday with the Secular Order of Franciscans we’ve joined. There was lots of reflection time and listening to talks. 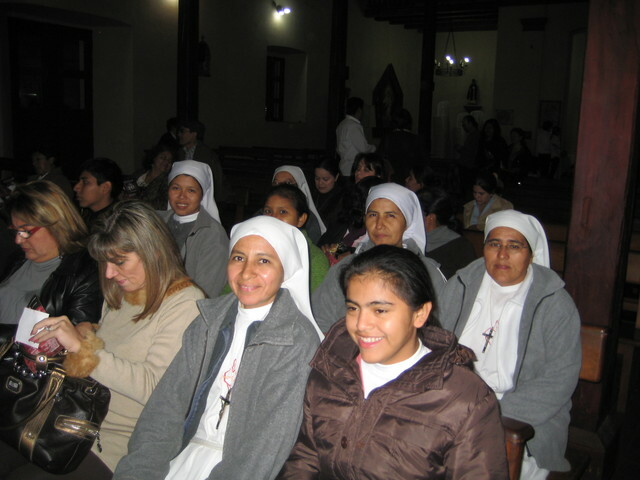 For me it was a nice affirmation of the faith that the people I work with everyday have; as well as a testament to how many people in the Santa Cruz region are dedicated to living a Franciscan lifestyle. It left me feeling good about the people of Bolivia and the outlook for the future. Sometimes it’s easy to get comfortable like that and forget: This is Bolivia. No sooner had we finished the retreat than we got robbed. At 6, we went out for dinner with the other volunteers. There’s a new restaurant that looks decent and is only one house down from the convent. So we walk over and sit down. We’re the first ones there because it’s still early for dinner here. And the food’s not ready yet (it’s a set menu) so we get some drinks and wait. A guy walks in and asks about food, but when the server walks back to the kitchen, the guy walks over, grabs Ramona’s purse off the back of her chair and runs! Tom moved the fastest and starts chasing him, but the guy had his friend outside with a motorcycle so once he hopped on that the chase was mostly lost. I ran after Tom, desperately trying to remember Spanish and I finally I get some “Ayuda, Ayuda” screams out while the motorcycle was still in view. The only hope was that a car would block the road so they couldn’t escape. But unfortunately the car that came thought Tom was the robber, since he was running, and didn’t try to stop the guys on the motorcycle. No doubt the motorcycle already had the escape route planned so there was no point in following on a motorcycle. After that things were just confusing, and I wasn’t sure who to trust. A bunch of people came out of their houses and crowded around and said they saw the guy or that they tried to help. Some kid walked up and said he knew the guy but didn’t know his name. I questioned the server, wondering if he wasn’t complicit with the whole thing. We’ll never know. I ran back over to the convent to ask the Sisters if there was anything we could do to report it and they said that even if you gave a description, because I got a really good look at the guy, the police wouldn’t do anything to catch him. The most frustrating part is that I’m almost certain it’s the same two men that have been causing trouble in our neighborhood for the last few weeks. Another volunteer, Fionn got robbed in the market, right in front of the Kinder in broad daylight. And the night before, Hermana (Sister) Manuela was walking home from her classes at the University and got her bag and head veil stolen right off of her! I don’t know how many other people have been hit, sounds like most people don’t even report it because they think the police are useless. It’s just insane, three robberies on the same block in two weeks time, most likely by the same guys, and no one’s going to do anything about it? Anyway, for now since they certainly know to target volunteers, we’ve instituted a “no bags rule” meaning that we don’t go out in the street with anything except money stuffed in our underwear or hidden pockets. Last night I was thinking about, what can you do when the police in your city don’t fight crime? Oh that’s right, call Batman. March has just been flying by and so I wanted to take a minute to tell you about all the great things that have been happening here. March 4th we celebrated the 8th birthday of our goddaughter, Carmen. We took her and two other girls out for a nice lunch and some ice cream. 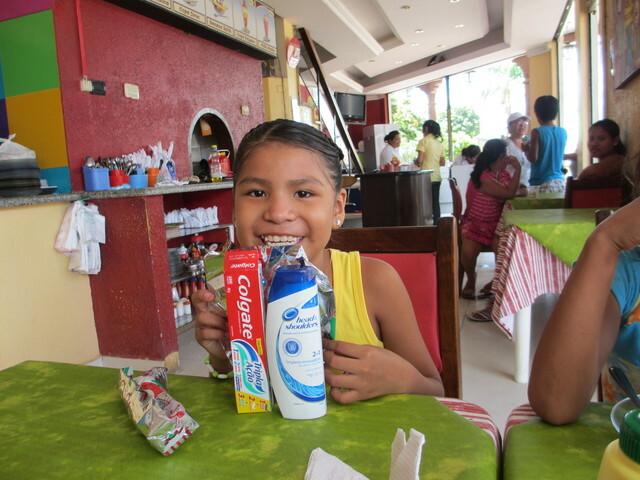 She was super excited about her new shampoo; Head and Shoulders is their favorite in the Hogar. Then the next weekend I went on a three day retreat with another young woman from the parish center. Most of the young people at the retreat were 15-19 years old but somehow I still had an awesome time and made new friends. 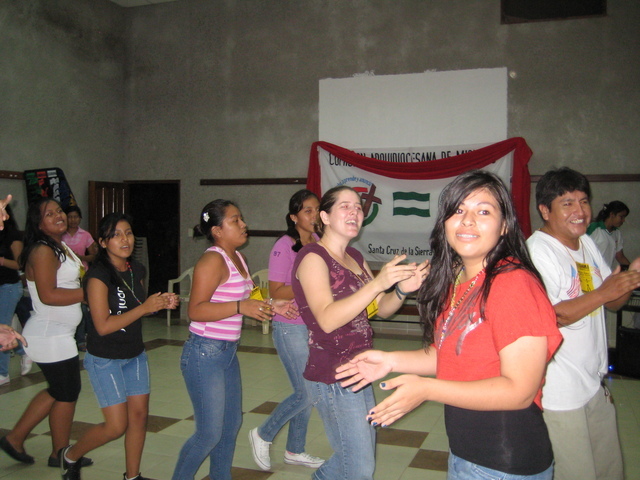 We learned lots of songs and games to do with our youth groups which is going to help me out immensely with my ‘Infancia Misionera’ group on Saturdays. The best part of the retreat was that it was totally focused on how to be a missionary. It was like an affirmation of the work I’m doing and a great spiritual check-in. All in all a great time. 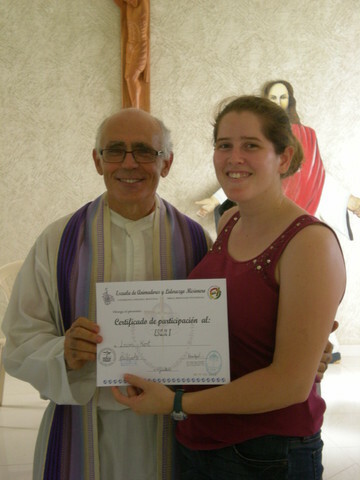 Finally I’m an officially certified missionary! 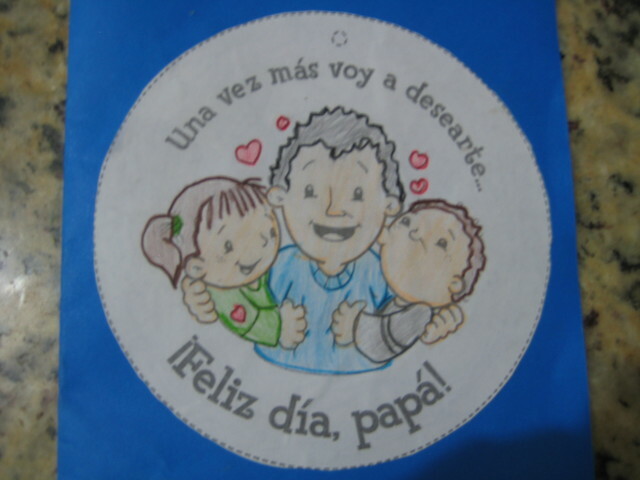 We also has the celebration of Dia del Padre, or Father’s Day, this past Monday. It’s celebrated on the feast of St. Joseph. Makes sense right? Our god-daughter made this really sweet card for Tom. An Hogar (girls’ home) little girl that comes to the Kinder always seeks me out during recess to hold my hand and wants to be picked up. I told her she needed to act like a big girl and go make friends and play with the other kids. She said, “I don’t want friends, I want my mom.” She’s been at the Hogar since Christmas. I don’t know what her situation is or if she’ll ever be able to live with her mom again but she doesn’t stop talking about her mom and her house. Just the other night she was telling me about how any day now she’d be going back to her house. For her sake, I want it to be true. On the playground today at the Kinder a little girl who knew me from last year because she did pre-kinder with us walked over and so I said, “Hi, how are you?” She pauses for a minute and says “My mom doesn’t recognize me. She’s in Spain.” After the shock settled, I said “Well of course it’s because you’ve grown so much this summer.” I know it’s a reality in many parts of the world where one or both parents goes to another country to work while the children stay behind with an aunt or grandma. It’s an accepted part of society here and I can understand the desire to have a better life. However when I see the effects in the children, I’m convinced it’s not worth it. On the Monday of Carnaval, the happiest, smiling 5-year-old at the Hogar got her finger smashed in a door. Apparently the cuts were pretty deep so they took her to the medical clinic. Unfortunately with it being Carnaval there was no doctor there and the doctor on call either couldn’t or wouldn’t come in. They went around to the few other free/low cost hospitals in town and none of them had any doctors/surgeons working either apparently. So they finally end up back to the first clinic with her at which point a doctor does show up and says that the wound is too old and can’t be stitched up because they hadn’t put ice on it. Therefore, he amputates the whole first digit of her middle finger. And for what? Because no one involved, not even the nurses at that clinic, had the wherewithal to give the poor 5-year-old some ice? Because the doctor took his sweet time arriving at the clinic? I have no word for the mixture of anger/sadness/frustration I felt. To end, another Kinder story. I was sitting after class talking to a little girl about the noisy boys at her table. I said “Oh those boys are so bothersome, they like to hit each other right?” She says “yeah,” and I say “They’re bad.” She says, “My mom’s bad.” I’m confused and say “I’m sure your mom’s not bad, why do you say she’s bad?” She replies, “Yes she’s bad. My dad hits her because she’s bad.” I said, “Does he hit you?” She said, “No but he’s doesn’t hit her now.” I said, “Ok good, hitting is bad.” She says “yeah….” looking thoughtful and our conversation trails off.